Police in Washington state launched an extensive search Saturday in the area where a girl missing since 2009 was found dead last fall. The remains of Lindsey Baum were discovered last year by hunters in a remote region of central Washington, but they were not identified as the 10-year-old who went missing while walking to a friend's house in 2009 until this week, Seattle ABC affiliate KOMO reported. The family from McCleary, Washington, searched for about an hour after she remained missing past her 10 p.m. curfew, but found no trace of her. The family called police, who simultaneously began a search effort and criminal investigation. Grays Harbor County Undersheriff Rick Scott told ABC News in late June 2009, "We're not ready to give up hope." There were no signs of Lindsey Baum until the hunters discovered remains in September 2017 in Kittitas County near Ellensburg, which were identified by the FBI on May 9, according to KOMO. The station reports there was a delay in identifying the remains because they were not associated with a crime. The search launched Saturday, about 20 miles west of Ellensburg, was delayed until spring by heavy snow in the mountainous area of Mount Rainier National Park. Ellensburg is almost 200 miles east of Baum's hometown of McCleary, Washington, which is located near Olympia. Search crews are working in heavily forested areas with steep cliffs and ravines hoping to find new evidence in the case, which has no suspects. Officials said 29 dog teams were brought in to aid in the search. ELLENSBURG, Wash. -- Part of Manastash Recreation Area will be closed through the weekend as authorities continue a search in connection with the death of a 10-year-old girl who disappeared nine years ago as she walked toward her home in McCleary. Kittitas County sheriff’s officials tweeted Thursday that the recreation area would be closed at Barber Springs and Buck Meadows through the weekend for “law enforcement activity.” The area is roughly 15 miles west of Ellensburg and about 9 miles northeast of State Route 410. Grays Harbor County Sheriff Rick Scott said the activity was related to the investigation into Lindsey Baum’s death and that detectives from his agency would be present. He referred further questions to the Kittitas County Sheriff’s Office. Kittitas County Undersheriff Clay Myers said deputies planned to conduct a search for additional evidence and might extend it beyond the weekend depending on what they find. 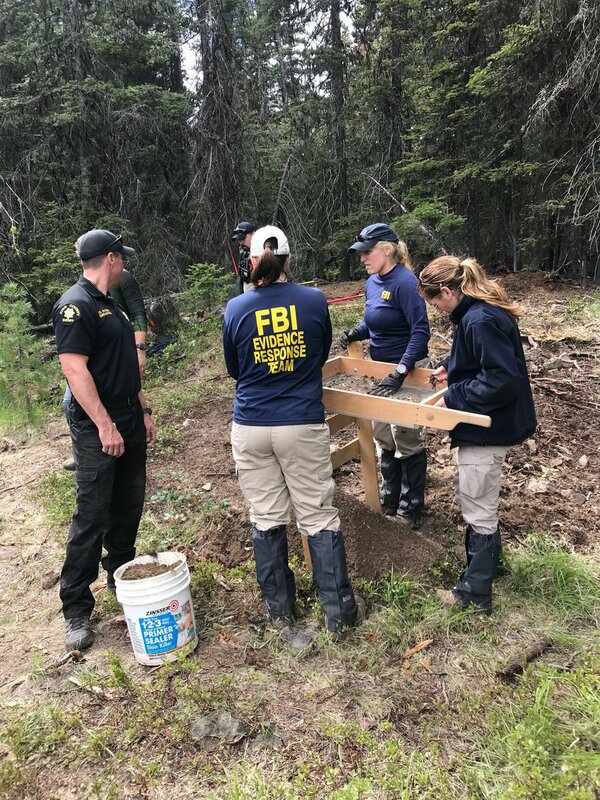 Nearly 200 volunteers and law enforcement officials are continuing a forensic search in the Manastash area today in connection to Lindsey Baum's skeletal remains that were found last fall in the same area. The search is believed to be one of the largest in state history based on the number of personnel involved. Volunteer search teams and law enforcement officials from across the state continue a large scale forensic search in the Manastash area today. Investigators are searching for anything that may be related to the skeletal remains found last fall that were later identified as those of Lindsey Baum, a 10-year-old girl last seen on June 26, 2009, in McCleary, WA, on her way home from a friend’s house. Search efforts over the past two weekends have drawn nearly 200 volunteers and law enforcement officials and 22 K9 teams from across the region. The search is believed to be one of the largest in state history based on the number of personnel involved. The search area covers approximately two square miles and is located roughly 20 miles west of Ellensburg, and is described as steep and heavily timbered with large cliffs and deep ravines. Forest Service Road 3100 in the Manastash area remains closed at Barber Springs and Buck Meadows. An update regarding the closure will be provided early next week. The Sheriff’s Office would like to express continued appreciation for the public’s cooperation and patience with the closures. The Kittitas County Sheriff’s Office is working in conjunction with the Grays Harbor Sheriff’s Office and the FBI. Grays Harbor S.O. and the FBI continue to lead the investigation into Baum’s disappearance. ELLENSBURG — A rugged, 2-square-mile area west of Ellensburg is expected to remain closed Monday as a search for evidence into a McCleary girl’s homicide continues. The U.S. Forest Service reports that the area along Forest Service Road 3100 between Barber Springs Road and Buck Meadows was expected to remain closed Monday and possibly longer. About 200 volunteers and law-enforcement officials, along with 22 police-dog teams, were in the area this weekend looking for possible evidence related to 10-year-old Lindsey Baum, who was last seen almost nine years ago when she left a friend’s home in McCleary, according to the Kittitas County Sheriff’s Office. Forest Service Road 3100-Manastash is closed between Barber Springs Road and the junction of FS Road 3100 and 3111 at Buck Meadows. Riders Camp and Manastash Campground, Manastash Trailhead and all roads and trails within this area are also closed. This closure is due to an ongoing investigation and will remain in place through Monday, May 21 and possibly longer. There is no estimated opening date at this time. This web site will be updated when new information becomes available. The Manastash recreation area (FS Road 3100) that was previously closed at Barber Springs and Buck Meadows is now open. Lindsey Baum’s mother will make her first public statement this week after her daughter’s remains were discovered outside of Ellensburg. Grays Harbor County Sheriff Rick Scott announced that he will be conducting a news conference on Thursday, June 14 at 1:00 pm at the McCleary Community Center in McCleary. Scott tells KXRO that there have been no new developments in this case, but this is a chance for Melissa Baum to make a statement to the media. On hand at the conference will be Kittitas County Sheriff Gene Dana to provide an an update on the searches that have taken place in Kittitas County. KXRO will livestream the event on our Facebook page. Thank you, grace-land. Lindsey has touched my heart during her very short time on this earth. My heart breaks for all who love her. I am hoping her Mother is able to shed some more light on what may have happened to her daughter. I am sure there is enough shoulda woulda coulda to go around in this town. I hope they can pull together and get justice for this little one. It is wonderful they have not forgotten her. I have always wondered about the white vehicle and the feelings Lindsey had about being followed. MCCLEARY, Wash. -- Melissa Baum spoke to the media Thursday for the first time since investigators linked the discovery of human remains to her daughter, who vanished nearly a decade ago. "The fact is a monster stole my 10-year-old little girl and they murdered her," Baum said. "And they dumped her like trash in the woods. So my fight now has turned from looking for my daughter to finding who killed her." Authorities say Lindsey Baum vanished nearly nine years ago from her hometown of McCleary, a small town west of Olympia. The girl was last seen the night of June 26, 2009, when she left a friend's home. She was going to walk the four blocks to her house but never arrived. Numerous searches took place in the hours and days after she vanished, and bloodhounds were brought in, but no sign of her was ever found. Her case attracted national attention in the aftermath of her disappearance. Nearly a decade later, investigators said Baum's remains had been found in Eastern Washington. Grays Harbor County Sheriff Rick Scott the remains were found by hunters last September. The remains were then sent to FBI headquarters in Quantico, Virginia, for analysis. Months later, authorities learned the DNA matched Lindsey Baum. "As long as there are monsters like this out on the street, none of our children are safe," Baum said. No arrests have been made. Scott said detectives are doing everything they can to find out who was responsible for Lindsey's death. Baum made an emotional plea for the public to send in any tips that could help bring justice for Lindsey. "I urge anyone who has information or knowledge of any kind to please come forward. We need justice. The people who did this to Lindsey deserve to be punished. And the children still out there -- your children -- deserve to be safe," Baum said. "This person is a monster and I grew up teaching my children that monsters didn't exist. So now when you're telling your children monsters don't exist, you're lying. Just keep that in mind. And they don't look like monsters, they look like your next door neighbor. They look like the person who lives down the street or the person who works in your school." Her disappearance has haunted me for years. It's heartbreaking that lil Lindsey has come home this way. Rest in Peace, lil Lindsey. Grays Harbor Sheriff Rick Scott told reporters the investigation is progressing, but there are no suspects at this time. Kittitas County Sheriff Gene Dana said the area where the remains were found has been searched, but results of the search are not being released. According to a flier given to reporters, the kidnapping and homicide are still under investigation by the Grays Harbor Sheriff’s Office and the FBI. Anyone with information about the case is asked to call the tip line at 360-964-1799 or email baumtips@co.grays-harbor.wa.us. After years with no new evidence in the case, Lindsey's remains were found in a rugged, remote area of Kittitas County in fall 2017. Her remains were identified through DNA analysis earlier this year. Grays Harbor County Sheriff Rick Scott said at Thursday's news conference that the discovery of Lindsey's remains has prompted a number of people to come forward with new tips and helpful information. "I think this is a very solvable case," he said. "I firmly believe we will find the person responsible and bring them to justice." She was last seen June 26, 2009, while walking home from a friend's house in her neighborhood. She would have been 19 years told as of Thursday. Melissa Baum, wearing a T-shirt bearing the tip line for her daughter's case, urged anyone with information to come forward. "We need justice," she said during her brief statement. "The people who did this to Lindsey deserve to be punished." Authorities continue to investigate the scene where Lindsey was found, but are not disclosing the exact location to protect the integrity of the case. But Grays Harbor County Sheriff Rick Scott and Kittitas County Sheriff Gene Dana said she was recovered about 20 miles west of Ellensburg in a steep, densely wooded area off a U.S. Forest Service road. The area is typically used for hunting and snowmobiling. Authorities from 17 different counties and 27 separate canine teams have combed the area, Scott said. Investigators from the Grays Harbor and Kittitas County sheriff's offices have met as recently as this week to discuss developments in the case, Scott added. "This is a very solvable case," he said. He claimed that people probably know information about the case that they don't know is relevant and again asked people who think they might know something to call the tip line. Tipsters may call 360-964-1799 or email baumtips@co.grays-harbor.wa.us.